This study aimed to observe the impact of Triamcinolone (TRI) on distal articular cartilage in rabbits subjected to Lumbosacral Plexus Nerve Block (LBPNB). A total of 32 New Zealand white rabbits were randomly divided into four groups: A1, 2.5 ml × 2 times; A2, 2.5 ml × 4 times; B1, 5 ml × 2 times; and B2, 5 ml × 4 times. The interval among these treatments was 5 d. Structural changes in Hip Articular Cartilage (HAA) were observed using an electron microscope, and flow cytometry was performed to detect the number of apoptotic cells for verification. Lower-limb muscle strength in these four groups was maintained at grades II-III after LBPNB; the electron microscopy results revealed that the HAA structures and development degrees in these four groups did not differ significantly, and the flow cytometry results were consistent with the electron microscopy results. Short-term (up to 20 d) intermittent (up to 4 times) Nerve Block (NB) combined with TRI (doses up to 10 mg) had no impact on hip cartilage cells. Lumbosacral plexus, Triamcinolone, Cartilage cells, Electron microscopy, Cells apoptotic. Pain may affect one’s daily life by limiting range of motion, strength, and functional recovery. Regional anesthesia for peripheral nerve stem or plexus, called a Nerve Block (NB), has been widely used as an effective diagnostic and therapeutic tool , especially in the management of acute or chronic pain . When considering the use of NB for chronic pain, clinicians must always consider the indications, risks, benefits, and proper techniques, such as epidural steroid injections, radiofrequency ablations, and sympathetic nerve neurolysis  to provide maximal benefits for patients. NB is a more conservative approach than surgery is, when the latter is not indicated or as a palliative bridge to surgery. For example, the superior ability of Suprascapular Nerve Block (SSNB) to relieve chronic shoulder pain was demonstrated in a meta-analysis of placebo and physical therapies , and many studies of steroid injections in patients with herniated discs, radiculopathy, and stenosis as well as with myofascial pain of masseteric origin reported significant benefits in pain scores, walking tolerance, and standing [5-7]. Steroid prescription selection and injection placement accuracy were identified as factors that would affect the treatment outcomes [8,9]. However, considering repeated steroid injection, the main concerns should be the amount of total steroid dose injected and the possibility of causing adrenal suppression and affecting bone reabsorption . At the same time, the impacts of NB on distal articular cartilages have not yet been reported, but clinical experience had shown that the addition of Triamcinolone (TRI) during NB exhibited good effects. Axoplasmic motion occurs inside the nerves, and it has not been reported whether this motion would transport glucocorticoids to the distal end of the articular cartilage to impact or even destroy the articular cartilage. The study used electron microscopy and flow cytometry to observe the impacts of different TRI doses and times on HAA. This animal experiment was performed in the animal laboratory center, Gui Yang Medical College, between September 2012 and April 2013. A total of 32 New Zealand white rabbits (6 months old, mean 2.95 kg (range, 2.75-3.25 kg), male and female rabbits) were randomly divided into four groups of eight each. This study was carried out in strict accordance with the recommendations in the Guide for the Care and Use of Laboratory Animals . The animal use protocol has been reviewed and approved by the Institutional Animal Care and Use Committee (IACUC) of Guizhou Provincial Orthopaedic Hospital. Pre-experiment: First, the waist fur was shaved off in three rabbits, which were then fixed in the lateral position. After the puncture site was confirmed (1.5 cm from the spinous process of the ileospinal connection), one needle was injected 2-2.5 cm deep; it broke the intertransverse ligament, and then entered the intergroove of the greater psoas muscle. After the positioning was accurately confirmed via radiography, 1 ml of iohexol was injected. The distribution of the contrast agent along the intergroove of the greater psoas muscle was then examined on Computed Tomography (CT) and the depths were recorded. Another three rabbits underwent localization using the same method, and the depth referred to the average depth obtained in the first step, during which the feeling of breakthrough should be noted; thereafter 2.5 ml and 5.0 ml of methylene blue were injected, and the rabbits were anesthetized with propofol. The rabbits were then anatomized for inspection of the location and distribution of methylene blue, which should be confirmed within the intergroove of the greater psoas muscle, and the distributions of the lumbosacral plexus nerves should be seen to confirm that the two methods had consistent localization results. The final concentrations of the mixture were as follows: lidocaine 0.5%, VB12 50 μg/ml, and TRI 2 mg/ml. The four experimental groups were treated as follows: A1, each rabbit was injected with 2.5 ml twice; A2, each rabbit was injected with 2.5 ml four times; B1, each rabbit was injected with 5 ml twice; B2, each rabbit was injected with 5 ml 4 times. The interval among injections was 5 d. The rabbits in group A1 and B1 were sacrificed 5 d after the second treatment was completed, and samples of the femoral head and femoral condylar cartilage were obtained. In the normal temperature state, femoral condylar cartilage was immersed in frozen liquid (2 mol/L dimethyl sulfoxide), the temperature was cooled to a deep low temperature (-70°C) by three gradients and then stored at -70°C. The rabbits in groups A2 and B2 were sacrificed 5 d after the fourth treatment was completed, and we sampled the femoral head and femoral condylar cartilage by using the same methods as for groups A1 and B1, followed by flow cytometry and electron microscopy together with the samples from groups A1 and B1. Each rabbit’s lower-limb muscle strength was observed, graded, and recorded according to the muscle strength gradation of humans; the morphological changes in HAA in each group were also observed by electron microscopy. Meanwhile, to further observe whether articular chondrocytes react to steroid therapy, flow cytometry was performed to detect the apoptosis of articular chondrocytes in each group to supplement the morphological observation results. Lower-limb muscle strength grades were compared using the Wilcoxon test, and the number of apoptotic cells was compared using Student’s t test. Values of P<0.05 were considered statistically different. After LBPNB, the lower-limb muscle strength in groups A1 and A2 was of grades II–III, while that in groups B1 and B2 was of grade II. Electron microscopy revealed no significant difference in HAA among the four groups as shown in Figures 1-5. 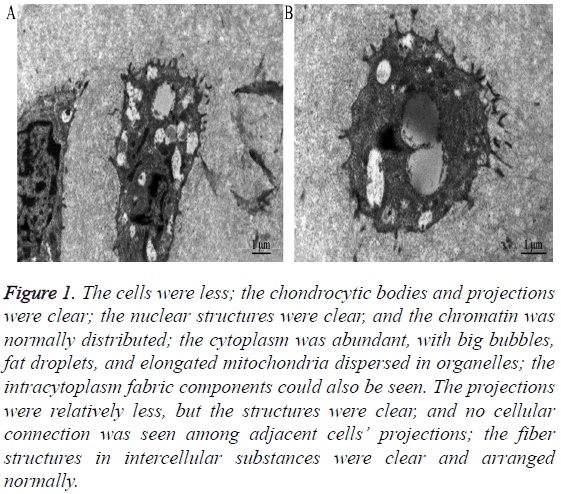 Figure 1: The cells were less; the chondrocytic bodies and projections were clear; the nuclear structures were clear, and the chromatin was normally distributed; the cytoplasm was abundant, with big bubbles, fat droplets, and elongated mitochondria dispersed in organelles; the intracytoplasm fabric components could also be seen. 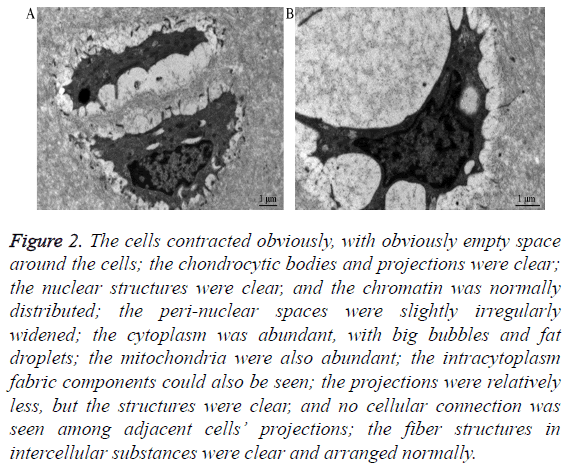 The projections were relatively less, but the structures were clear, and no cellular connection was seen among adjacent cells’ projections; the fiber structures in intercellular substances were clear and arranged normally. 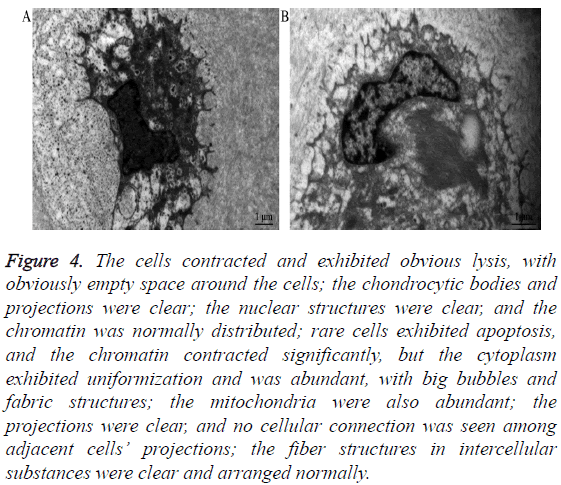 Figure 2: The cells contracted obviously, with obviously empty space around the cells; the chondrocytic bodies and projections were clear; the nuclear structures were clear, and the chromatin was normally distributed; the peri-nuclear spaces were slightly irregularly widened; the cytoplasm was abundant, with big bubbles and fat droplets; the mitochondria were also abundant; the intracytoplasm fabric components could also be seen; the projections were relatively less, but the structures were clear, and no cellular connection was seen among adjacent cells’ projections; the fiber structures in intercellular substances were clear and arranged normally. 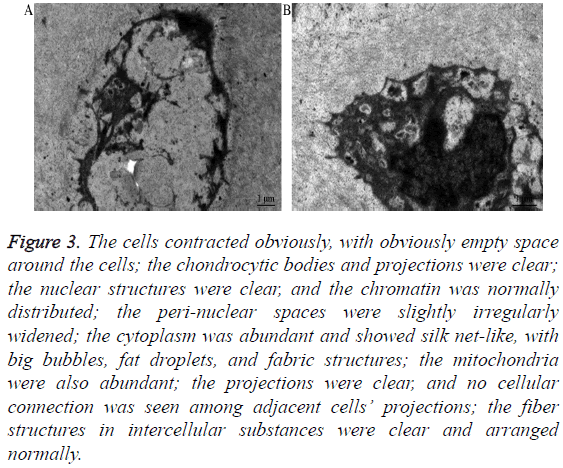 Figure 3: The cells contracted obviously, with obviously empty space around the cells; the chondrocytic bodies and projections were clear; the nuclear structures were clear, and the chromatin was normally distributed; the peri-nuclear spaces were slightly irregularly widened; the cytoplasm was abundant and showed silk net-like, with big bubbles, fat droplets, and fabric structures; the mitochondria were also abundant; the projections were clear, and no cellular connection was seen among adjacent cells’ projections; the fiber structures in intercellular substances were clear and arranged normally. Figure 4: The cells contracted and exhibited obvious lysis, with obviously empty space around the cells; the chondrocytic bodies and projections were clear; the nuclear structures were clear, and the chromatin was normally distributed; rare cells exhibited apoptosis, and the chromatin contracted significantly, but the cytoplasm exhibited uniformization and was abundant, with big bubbles and fabric structures; the mitochondria were also abundant; the projections were clear, and no cellular connection was seen among adjacent cells’ projections; the fiber structures in intercellular substances were clear and arranged normally. Figure 5: Pathological findings of hip articular cartilage in different groups (40X). The detection results of apoptotic cells in the four groups were 9.30 ± 2.33, 10.35 ± 2.30, 10.63 ± 1.66, and 11.05 ± 0.9, respectively, and no significant difference was observed among the four groups (P>0.05). Epidural steroid injections and lumbar nerve root block/steroid injections are commonly administered interventional treatments for spine-related pain . Several studies have presented evidence that blocking peripheral nerves effectively treats some neuralgias and could reduce pain frequency, intensity, and duration . In this study, we found that the lidocaine injection led to nerve anesthesia, and because the simultaneous injection of steroids could relieve inflammation and treat pain, the outcomes could be better than those of lidocaine alone. The mechanisms underlining this were considered related with the fact that hormones could regulate the peripheral nerve microenvironment, reduce the inflammation and edema at the lesions, and promote the absorption of inflammatory mediators. The mechanisms of the effect of NB on chronic pain lay in blocking the vicious pain cycle, suppressing the central sensitization, simultaneously improving blood circulation, and promoting the absorption of inflammatory mediators; NB could also relieve muscle spasms and improve muscle nutrition [14,15]. Steroid injection therapies are frequently used in chronic pain treatment since the signs and symptoms of inflammation can be rapidly and effectively controlled  by reducing the inflammation around the nerve roots, which contributes to pain . For example, the addition of perineural dexamethasone to local anesthetic solutions could significantly improve postoperative pain control in brachial plexus block but not increase the complications in a system analysis, and smaller doses of dexamethasone (4-5 mg) were as effective as higher doses (8-10 mg) , but the volume of local anesthetic varied widely from 5 ml to 10 ml in recent studies [19,20] and even up to 20 ml . In fact, after consideration of human and rabbit weights, the volume we used in our study might have exceeded 20 ml, so smaller doses of TRI and shorter therapy durations might be as effective as higher doses and longer therapy durations; however, future studies are required to confirm our findings. A meta-analysis that included peripheral nerve blockade in 29 controlled trials of 1695 participants confirmed that dexamethasone could increase the mean duration of analgesia in anesthetics acting locally , which verified the effectiveness of nerve blocks using an anesthetic and a steroid. However, safety concerns have always been considered in NB because spinal cord injuries are also known to occur with interventions such as epidural steroid infiltrations , and only one study showed that TRI induced chondrotoxicity in chondrocytes in vivo . Some studies also found that corticosteroids have a time- and dose-dependent effect on articular cartilage, with beneficial effects occurring at low doses and durations and detrimental effects occurring at high doses and durations [25,26]. Since TRI was used in the NB, the concentrations were very low, which may be the reason for the lack of intergroup differences, which might explain why shortterm steroid use had no effect in the articular cartilage. This study was performed in rabbits, which are different from humans. We may find structural changes in patients who undergo hip replacement surgery in the future. There were no structural changes in hip cartilage cells in the lumbosacral plexus nerve block based on different triamcinolone doses and durations. This work was funded by Projects of Guizhou Science and Technology Department, (No. QKHLS (2012) 051). Farr J, Jaggers R, Lewis H, Plackis A, Sim SB. Evidence-based approach of treatment options for postoperative knee pain. Phys Sportsmed 2014; 42: 58-70. Jeon YH. Easier and Safer Regional Anesthesia and Peripheral Nerve Block under Ultrasound Guidance. Korean J Pain 2016; 29: 1-2. Hayek SM, Shah A. Nerve blocks for chronic pain. Neurosurg Clin N Am 2014; 25: 809-817. Chang KV, Hung CY, Wu WT, Han DS, Yang RS, Lin CP. Comparison of the effectiveness of suprascapular nerve block with physical therapy, placebo, and intra-articular injection in management of chronic shoulder pain: a meta-analysis of randomized controlled trials. Arch Phys Med Rehabil 2016; 97: 1366-1380. Riew KD, Yin Y, Gilula L, Bridwell KH, Lenke LG, Lauryssen C, Goette K. The effect of nerve-root injections on the need for operative treatment of lumbar radicular pain. A prospective, randomized, controlled, double-blind study. J Bone Joint Surg Am 2000; 82: 1589-1593. Ghahreman A, Ferch R, Bogduk N. The efficacy of transforaminal injection of steroids for the treatment of lumbar radicular pain. Pain Med 2010; 11: 1149-1168. Quek SY, Subramanian G, Patel J, Ananthan S, Zagury JG, Khan J. Efficacy of regional nerve block in management of myofascial pain of masseteric origin. Cranio 2015; 33: 285-290. Jones A, Regan M, Ledingham J, Pattrick M, Manhire A. Importance of placement of intra-articular steroid injections. BMJ 1993; 307: 1329-1330. Caldwell JR. Intra-articular corticosteroids. Guide to selection and indications for use. Drugs 1996; 52: 507-514. Benzon HT. Essentials of pain medicine. Philadelphia Elsevier Saunders 2011. Tornqvist E, Annas A, Granath B, Jalkesten E, Cotgreave I, Öberg M. Strategic focus on 3R principles reveals major reductions in the use of animals in pharmaceutical toxicity testing. PLoS One 2014; 9: 101638. Eckel TS, Bartynski WS. Epidural steroid injections and selective nerve root blocks. Tech Vasc Interv Radiol 2009; 12: 11-21. Dach F, Eckeli AL, Ferreira Kdos S, Speciali JG. Nerve block for the treatment of headaches and cranial neuralgias-a practical approach. Headache 2015; 55: 59-71. Dorn C, Rumpold-Seitlinger G, Farzi S, Auer J, Bornemann-Cimenti H. The effect of the modified lateral suprascapular block on shoulder function in patients with chronic shoulder pain. Anesth Pain Med 2015; 5: 31640. Baheti DK. Role of interventional pain management in pain practice. J Assoc Physicians India 2015; 63: 29-31. Weitoft T, Ronnelid J, Knight A, Lysholm J, Saxne T, Larsson A. Outcome predictors of intra-articular glucocorticoid treatment for knee synovitis in patients with rheumatoid arthritis - a prospective cohort study. Arthritis Res Ther 2014; 16: 129. Rathmell JP. Atlas of image-guided intervention in regional anesthesia and pain medicine. Philadelphia: Wolters Kluwer Lippincott Williams Wilkins Health 2012. Knezevic NN, Anantamongkol U, Candido KD. Perineural dexamethasone added to local anesthesia for brachial plexus block improves pain but delays block onset and motor blockade recovery. Pain Physician 2015; 18: 1-14. Meier G, Bauereis C, Maurer H. The modified technique of continuous suprascapular nerve block. A safe technique in the treatment of shoulder pain. Anaesthesist 2002; 51: 747-753. Roark GL. Suprascapular nerve block at the spinoglenoid notch. Reg Anesth Pain Med 2003; 28: 361-362. Barber FA. Suprascapular nerve block for shoulder arthroscopy. Arthroscopy 2005; 21: 1015. Albrecht E, Kern C, Kirkham KR. A systematic review and meta-analysis of perineural dexamethasone for peripheral nerve blocks. Anaesthesia 2015; 70: 71-83. Kumar N. Spinal cord injury complicating a thoracolumbar selective nerve root block in a deformed spine: neurological and functional outcome. Spinal Cord 2015; 1: 3-5. Syed HM, Green L, Bianski B, Jobe CM, Wongworawat MD. Bupivacaine and triamcinolone may be toxic to human chondrocytes: a pilot study. Clin Orthop Relat Res 2011; 469: 2941-2947. Wernecke C, Braun HJ, Dragoo JL. The effect of intra-articular corticosteroids on articular cartilage: a systematic review. Orthop J Sports Med 2015; 3: 2325967115581163. Euppayo T, Siengdee P, Buddhachat K, Pradit W, Chomdej S, Ongchai S, Nganvongpanit K. In vitro effects of triamcinolone acetonide and in combination with hyaluronan on canine normal and spontaneous osteoarthritis articular cartilage. In Vitro Cell Dev Biol Anim 2016; 52: 723-735.